WALPOLE, Mass. 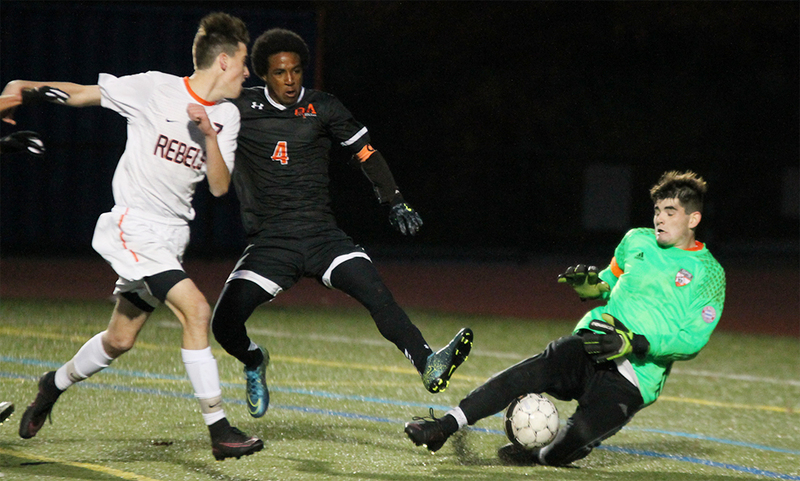 – Oliver Ames knew it had a tough test to start its 2016 postseason run with a visit to Walpole, the Bay State Conference’s Herget Division champions. The Tigers passed the test with flying colors. 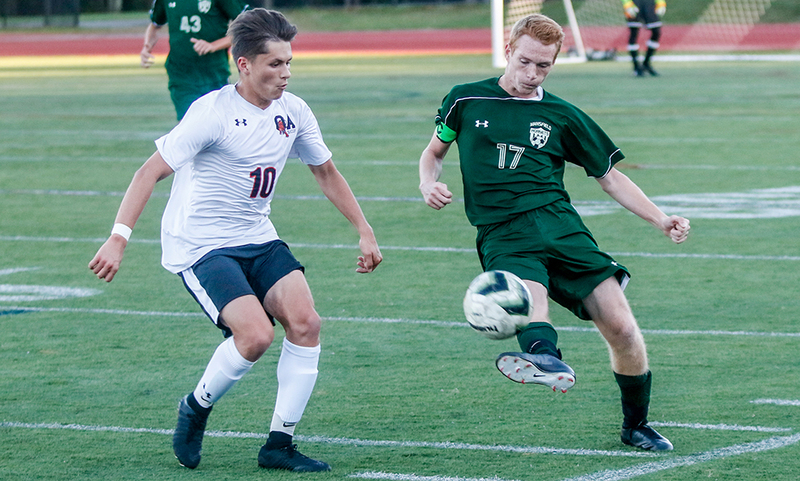 Oliver Ames senior Thomas McCormick and junior Matt Alvarado each scored a pair of games – both finding the back of the net once in each half – and the 11th seeded Tigers rolled to a 4-1 win over #6 Walpole. It took less than a minute for Oliver Ames to show off its offensive talents against the Rebels. McCormick laid the ball off to junior Nathaniel Cardoza, who wasted little time before unleashing a shot that Walpole keeper Devin Moore just got a paw to it to push it over the bar. The Tigers kept up the pressure and it paid off in the 12th minute. After McCormick drew a free kick on the right sideline, junior Mason Galbato drove a service right onto the doorstep of Walpole’s net. Pressure from Cardoza forced Moore into a save but the ball popped loose and McCormick was in the right perfect spot and placed it into the back of the net. The lead only lasted a minute though. After OA failed to clear a cross, Walpole senior Adedamola Ojuolape ripped a shot that clanked off the near post. The rebound fell to senior Jonathan Sarkis and he made no mistake about it, finding the far corner to level the score in the 13th minute. 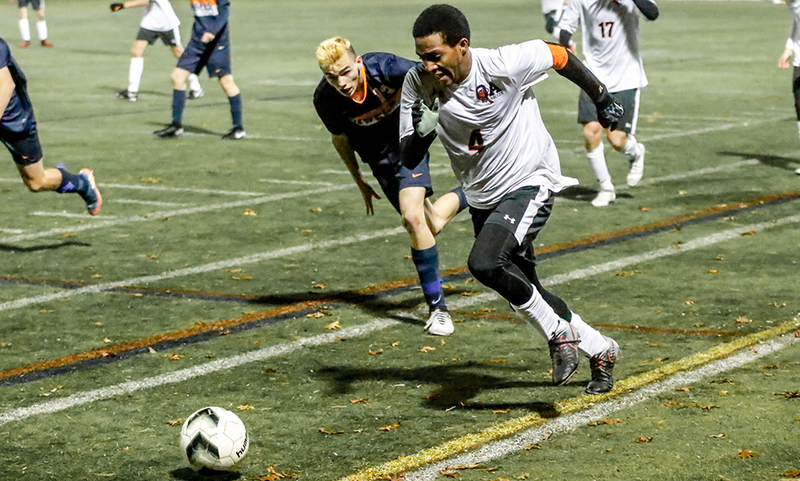 Despite surrendering the tying goal in such short time, Oliver Ames didn’t waver. Minutes after coming off the bench, Alvarado put the Tigers back ahead with a terrific strike. As OA entered the attacking third, McCormick found Cardoza on an overlapping run and Cardoza quickly found Alvarado alone in the center of the pitch. Given time and space to turn, Alvarado did just that, taking a touch before uncorking a beautiful shot into the upper 90 from 30 yards out, leaving Moore no chance at a save and putting OA up 2-1. Eight minutes after OA went up a goal behind Alvarado’s strike, the junior nearly grabbed his first assist of the game. Walpole had a free kick from less than a yard outside the area but the shot went into the wall. The ball was quickly played up to Alvarado, who beat a defender and raced towards goal, eventually sliding the ball back across to Jack Sheldon, but his shot was gobbled up by Moore. 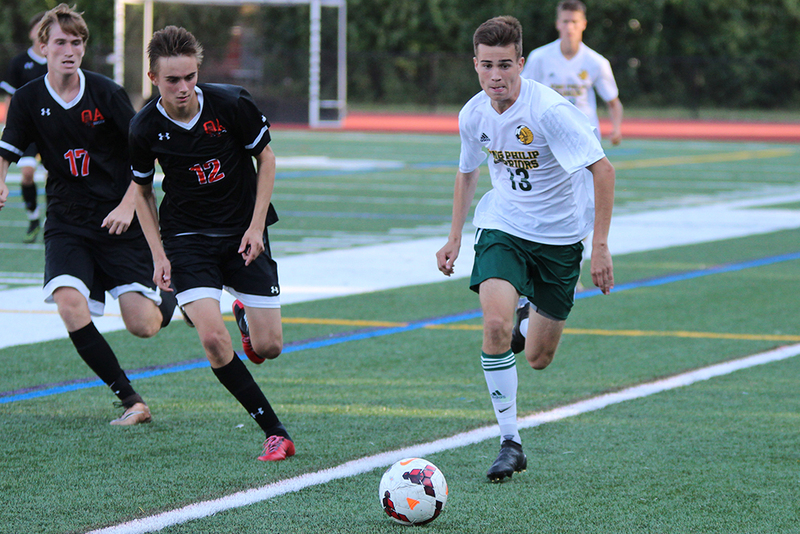 The Tigers, who continually dealt with Walpole’s long ball style of offense, came through with a key goal early in the second half. In the 56th minute, Cardoza played a through ball for Alvarado to run onto. Alvarado got to the ball just before Moore did as he came charging out, forcing the keeper to bobble the ball. The ball eventually fell to the foot of McCormick, who once again buried the rebound for a 3-1 Tiger lead. 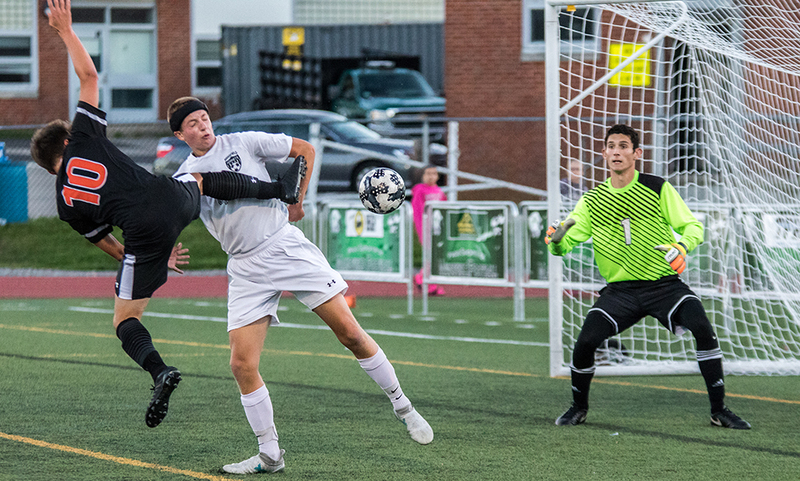 “Tommy has been a senior leader for us, especially during the second half of the season he’s really stepped up and taken over the team with his calm, cool demeanor,” Barata said. “He’s one of the best players in the league, easy. He really took control of the team for us to take this next step. Walpole had its best chances in a five minute span late in the second half. Justin Burns saw his free kick from 30 yards out sail just over the bar in the 68th minute. In the 70th minute, Aidan Murray hit a half volley that forced a diving save from OA keeper Jack Carroll. In the 73rd minute, Carroll was forced into another save, but this time his frantic dive led to a handball outside the area, and a yellow card. The yellow card forced a substitution with Ben Kemp coming in to face a Walpole free kick from just outside the area. The shot was deflected but Kemp did well to cover the ball. Two minutes later, the Tigers found their fourth and final goal. Cardoza jumped on a loose ball near midfield and used a Maradona move to spin past a pair of oncoming defenders. The junior delivered a pass wide to Alvarado, who was open on the left wing. Alvarado took two touches and ripped a shot that hit the underside of the crossbar and went in. 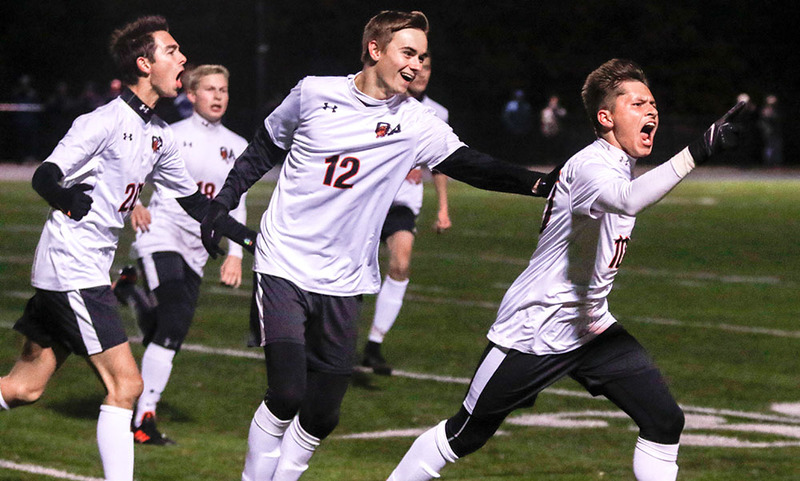 Oliver Ames boys soccer (10-4-3) advances to the D2 South Quarterfinal for the fourth straight year and will travel to #3 Dartmouth (14-1-3) on Wednesday at 5:00.